Cable ampacity is limited by the peak temperature to which the insulation is subjected, which is the sum of the ambient earth temperature plus the cable temperature rise over ambient. External sources of heat, such as a parallel electric power cable or a steam main, raises the effective earth temperature seen by the cable. Thus, cable ampacity is reduced by such an external heat source. It is widely understood that another cable or other heat source running in parallel with a cable for a significant distance will require derating the cable's ampacity. This is commonly taken into account when designing underground distribution systems. What has not been understood, however, is the effect of heat sources which cross a cable, or run in parallel for a short distance. It has been commonly assumed that longitudinal heat transfer along a cable disperses the heat from the crossing point or the location where cables are in parallel for a short distance. It is the practice of many utilities to ignore the effect of crossings if the cable is more than a couple feet above or below the crossing external heat source. 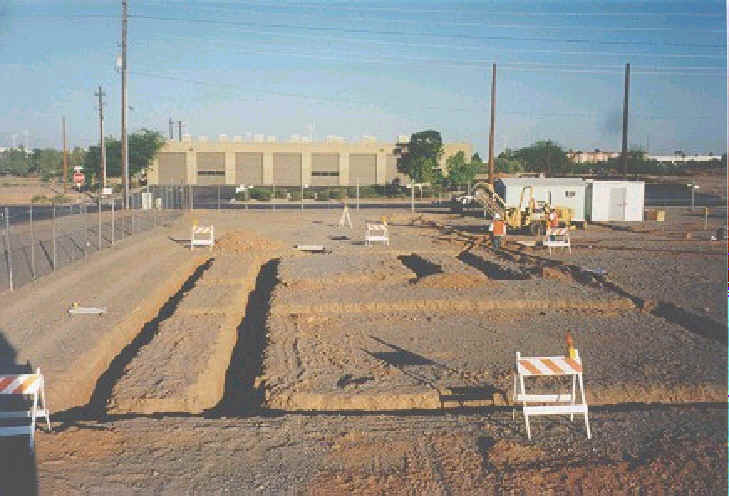 One commonly encountered situation is where padmounted equipment (e.g., transformer or switchgear) is set back several feet from the main cable trench line. 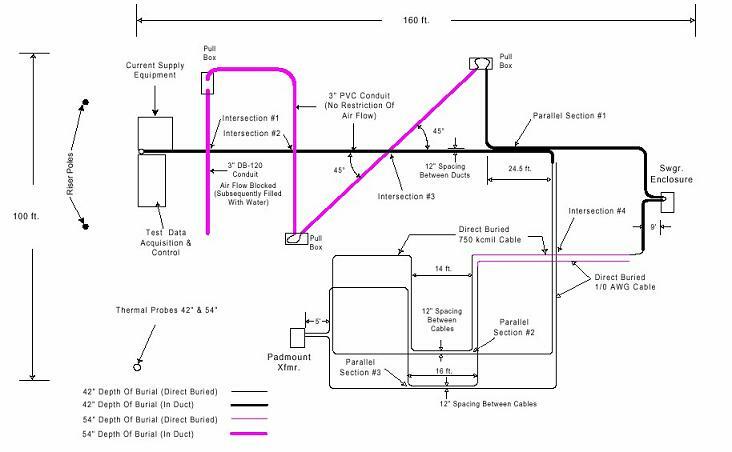 Cable circuit looping in and out of the equipment are often layed in close parallel proximity for the distance between the main trench and the padmounted equipment, as shown in the figure below. The incoming and outgoing cables are typically in a common trench or duct bank for the tap distance. Most utilities do not consider this short distance when establishing cable ampacity limits. The figure below illustrates the flow of heat away from the crossing point due to convection in the duct and conduction through the cable. This complex heat flow problem was investigated in a recent DSTAR research project. While longitudinal heat flow is an important mitigating factor, there still can be significant elevation of cable temperature due to crossing with spacing much larger than two feet, and for common configurations such as the transformer tap described above. The second figure below illustrates the temperature elevation. As a result of this research, a methodology was developed for calculating the cable temperature elevation, which is then used to derate cable ampacity. These algorithms were included in a software application called XDERATE, part of the collection of DSTAR distribution engineering software tools, which the DSTAR members received to use in their underground system design.